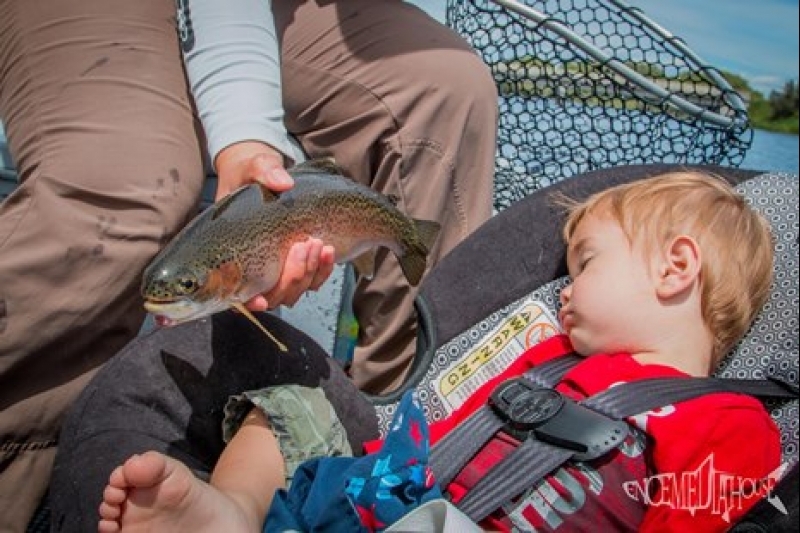 It’s hard to believe it has been two weeks since our last fishing report. A lot can happen in two weeks. The flow from Island Park Dam increased from just over 1000 cfs to a peak of over 1600 cfs. Now it is back down to 1300 cfs. One benefit from higher flows has been lower water temperature. Great hatches have been the result. We’ve experienced superb hatches of PMDs, Green Drakes, Brown Drakes, Flavs, caddisflies and other aquatic insects. Fishing has quieted down some in the Ranch since the beginning of the month but you can still find some nice fish rising, especially on cloudy days. Look for rusty spinners in the morning hours with PMDs later in the morning. There are still some Flavs in the afternoons but this great hatch is likely on the wane. Now is the time to start looking for Callibaetis in the slow sections of the Ranch and Tricos won’t be far behind. With above normal flows from Island Park to Chester and below normal flows at St. Anthony the lower river has been pretty tough. Cooler weather and reduced flows from Island Park should help perk things up. This has been the year of the South Fork. We can’t remember better fishing on this great river. The Salmonfly hatch was exceptional. It has pretty much fizzled out but right behind has been Golden Stones, Yellow Sallies, PMDs and caddisflies. The word is out and our phone has been ringing off the hook with customers wanting to fish there. In fact I’ve been called off the bench to help the guiding cause and I’ve spent the last two days on the South Fork. All I can say is I’m thankful that Henry’s Fork Anglers is one of 7 outfitters with a legal outfitter’s license to guide on the South Fork. Another river that we can take guide clients is the Teton. Fishing has been superb from the meadow section in Teton Basin, through the Teton Canyon and the lower farm country near St. Anthony. 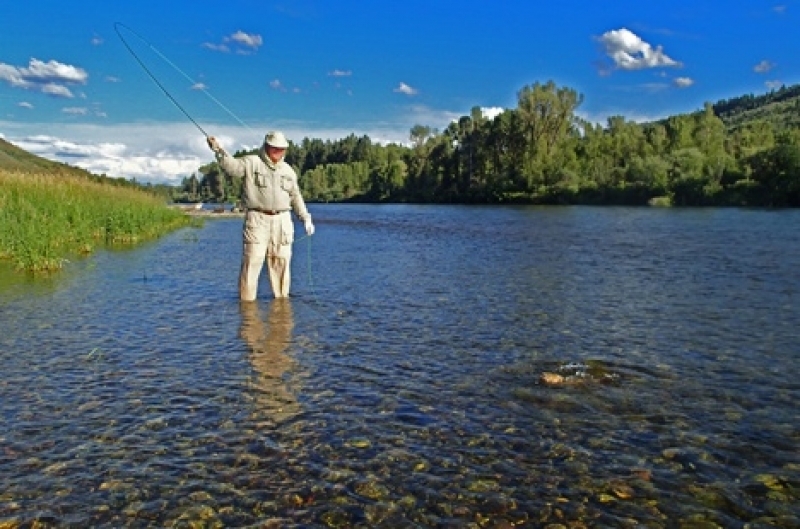 Our guiding demand has also required my services as a guide on the Teton River. In fact I’ve spent 5 days out of the past two weeks on the Teton. Normally I personally don’t do a lot of guiding but I really enjoy it whenever the call comes. My son Chris and I only take guide trips if we are completely booked and there are no other options. As a result both of us have been taking a lot of trips lately. Our appreciation goes out to Todd Lanning, Jay Hurt, Scott Kennedy, John Crossly and especially my wife Sheralee for their hard work in the store while we’ve been covering some of the guide trips. Cooler weather this past week has also benefited the Madison River. It has been a great year on the Madison. Like the Henry’s Fork there were some erratic flows but things have stabilized. The current streamflow is a little below normal. Best fishing has been in the mornings before noon and later in the evening. Fishing has also been good in the section between the lakes. 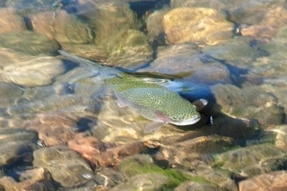 There are also good fishing options in Yellowstone Park. July is always a good time to fish the smaller streams in the park. One of our favorites is the Gallatin before it exits the park above Big Sky. The Lamar River and Slough Creek are also good options but recent thunderstorms have resulted in turbid water. If you are looking for quality rather than quantity you should consider the Yellowstone River below Fishing Bridge downstream to Sulfur Caldron. This water opened on July 15. Years ago it was loaded with 17 inch Cutthroats. The population is far less today but the fish are much larger. 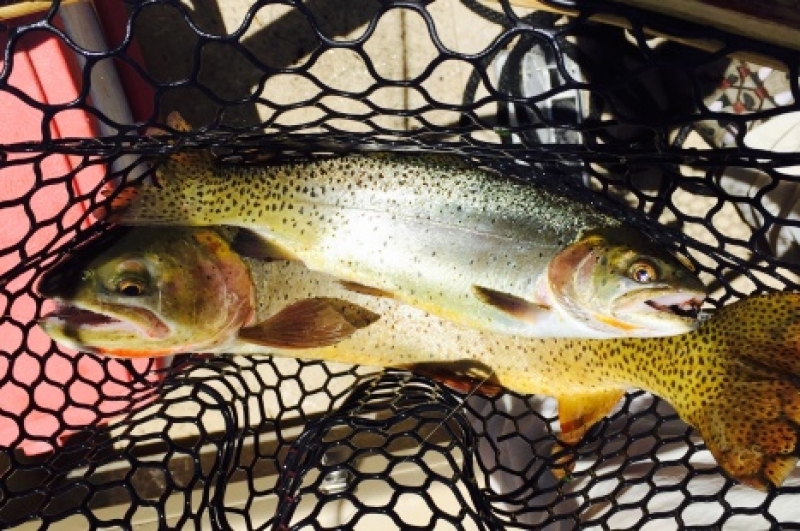 It isn’t uncommon to hook a two-foot trout but you’ll need to hunt for them.